I’ve never really been a big fan of pavlova, except for picking the strawberries off the top! So when it comes to making a dessert for Christmas Day I tend to widen the net a little and introduce my family to something new. This year various dietary requirements of different family members threatened to make things a little more complicated, so I turned to my dog eared, sticky and thoroughly loved copy of ‘My Darling Lemon Thyme’ by Emma Galloway. I love Emma’s recipes. They’re easy, delicious, gluten free and an absolute go-to in our household. 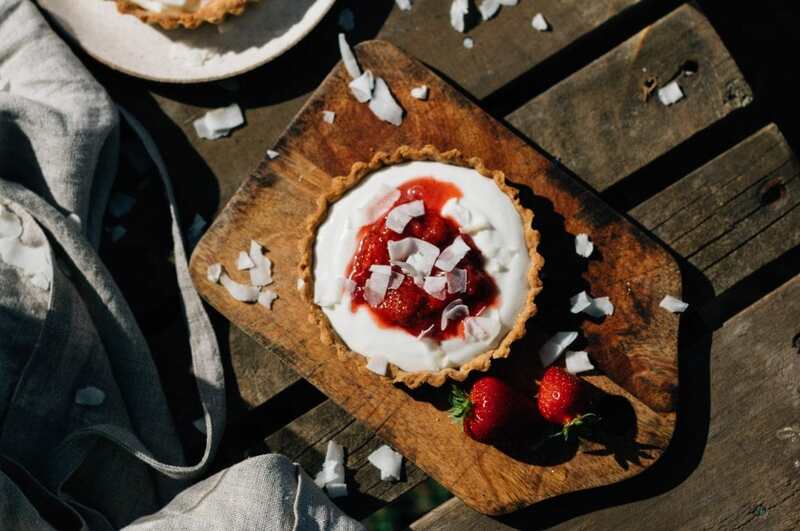 I’d made her ‘Strawberry Lemon Thyme Tarts’ before with huge success and decided they fit the bill perfectly for a Christmas gathering – they have strawberries (and so are not only delicious but look suitably festive), and they can be made ahead of time and then assembled before eating (minimising stress at least tenfold). I also thought they’d work perfectly with the 27seconds Sauvignon Blanc I had stored for the occasion. It’s crisp, light and a little bit tangy – the perfect compliment to the not-too-sweet tarts. I decided to try a little variation on the recipe and was pleased to find it worked really well. I think with any good recipe you can generally use it as a base and then mix up the flavour combinations if you’re so inclined. Grease 6 tart cases. 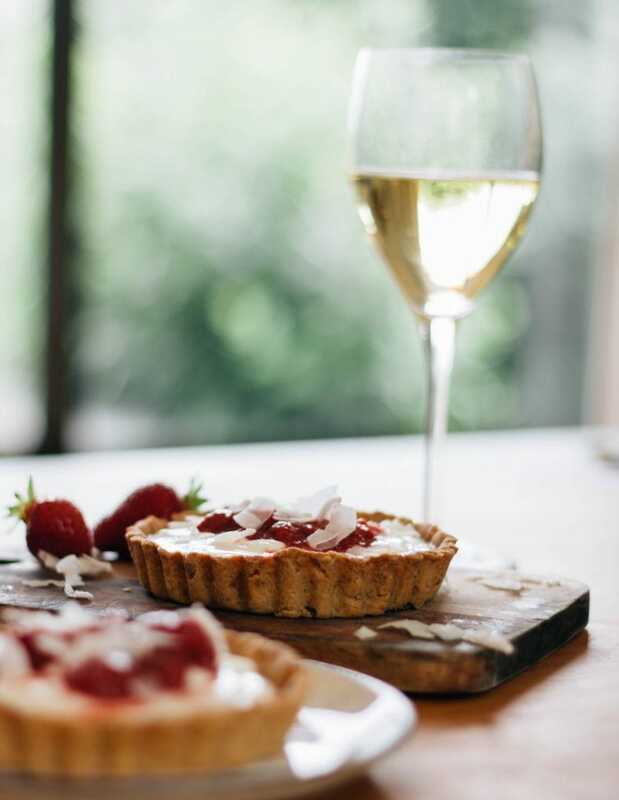 I find the tart cases pretty essential in making sure your tarts don’t crack, and they make it feel extra special. You can find them at Briscoes for a decent price, although beware; they come in a pack of four, and if you’re making more than four tarts it would be so much easier to have the right amount of cases. I spent ages waiting for tarts to cook and cool and dough to chill because I had to do three rounds of baking in each of the four cases! Put brown rice flour and cornflour or tapioca, ground almonds and sugar into food processor or blender and pulse until combined. Add the butter and pulse until coarse breadcrumbs are formed. I find I have to help my blender along with this step, constantly stopping and shoving a wooden spoon in to make sure it all mixes! Add the chopped almonds and pulse a couple more times. The mixture won’t be smooth, but don’t worry. Add the egg and mix until combined. If your blender isn’t handling this step, take out the mixture and add the egg by hand, kneading a little as you go. 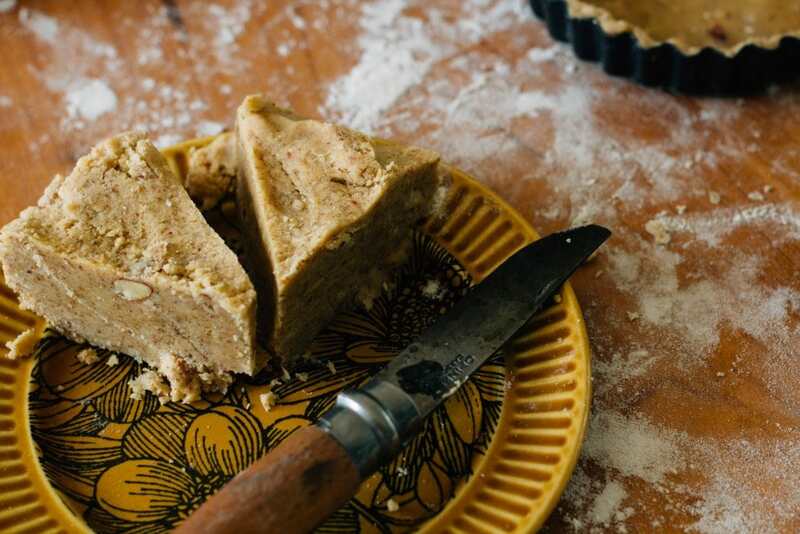 Form the dough into a disc shape, cover and pop in the fridge to chill until you’re ready for the next step, (I had some dough in the fridge for a couple of days and it was fine). Use a knife to evenly slice the dough into six portions (like a pizza). Roll each portion out individually on a floured surface until it’s a few millimetres thick. Not too thin or it will be difficult to insert into your tart cases. 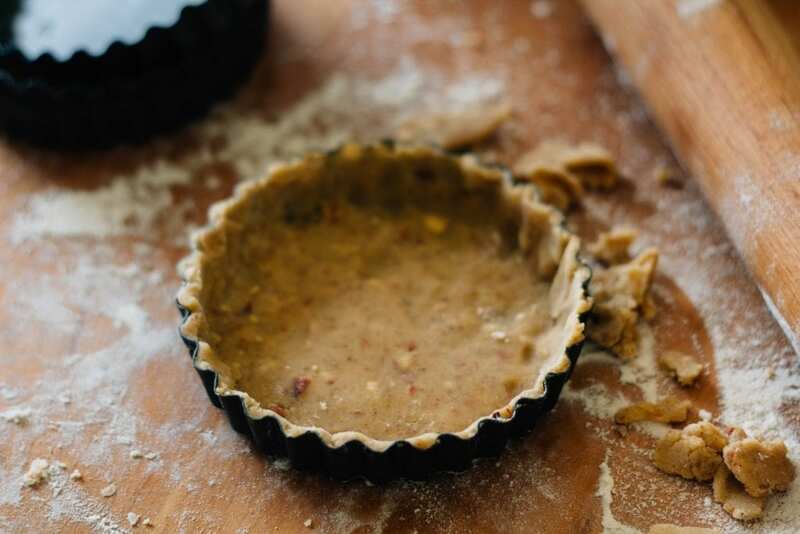 Carefully lift the dough into the tart case and use your fingers make sure it’s nice and snug and fairly evenly spread. 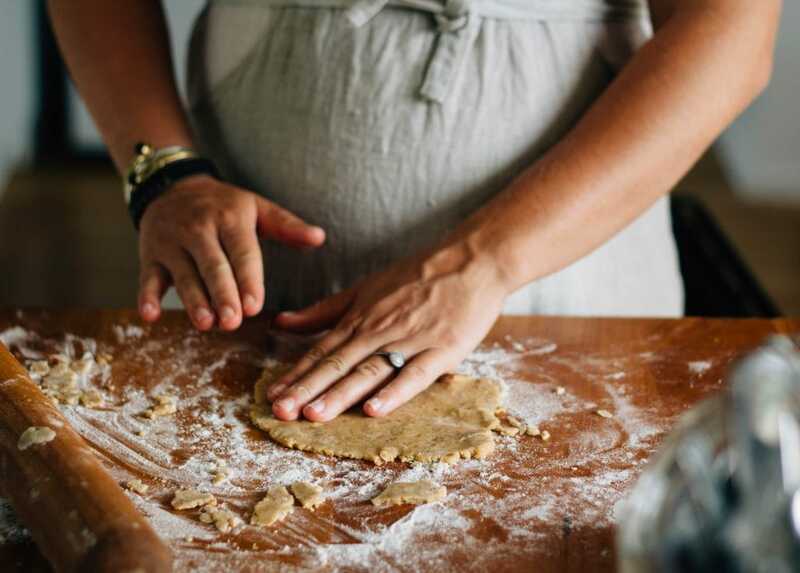 Don’t stress if the dough rips or breaks, just patch it up with a little extra. Tidy up the tops and pop your tarts in the freezer for 20 minutes. 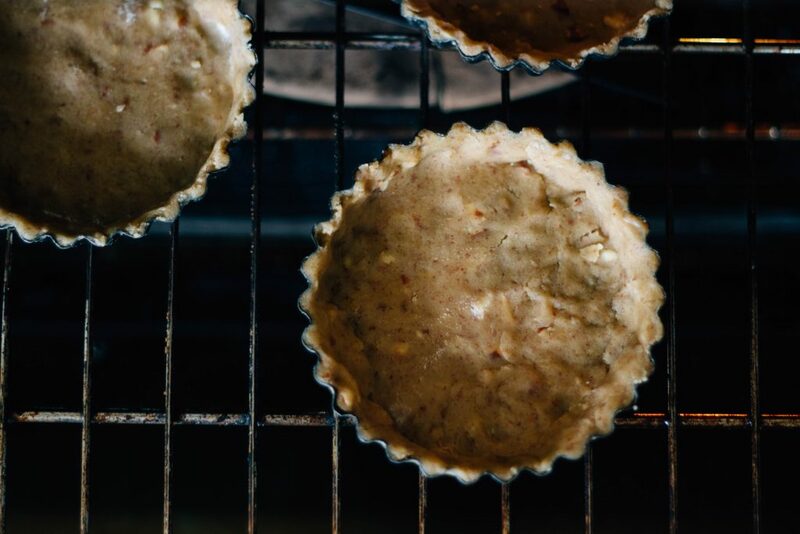 Preheat oven to 180 C.
Once chilled, bake the tart shells in the oven for 15-20 minutes until slightly golden. Once cooked, remove from the oven and let cool completely before removing from tart cases. Be very careful handling your shells as they can easily break! Put the strawberries, lime juice and sugar in a saucepan. Cover, and cook at a medium heat for 2-4 minutes, stirring occasionally. Add the cornflour and water and stir constantly for 45 seconds or until slightly thickened. Remove from the heat and cool. The strawberries should be just starting to break down when you remove them from the heat. Combine both yoghurts and honey until evenly distributed. 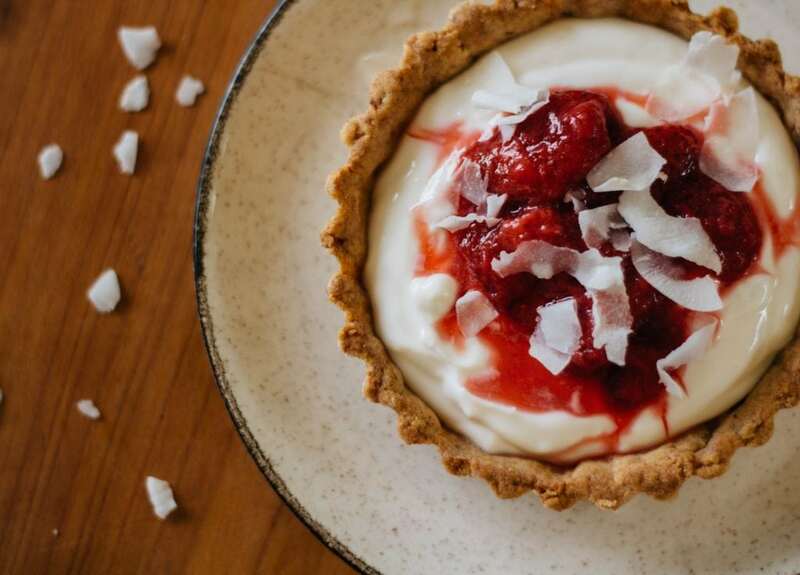 To assemble, distribute yoghurt mixture amongst tart cases and top generously with strawberry lime compote. Scatter with a handful of coconut flakes. Serve immediately. 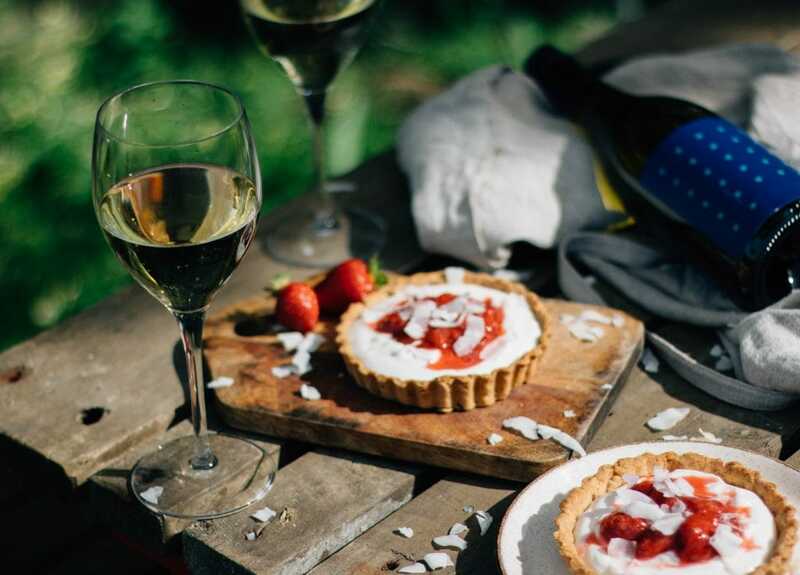 We recommend pairing your tarts with a nicely chilled glass of 27seconds Sauvignon Blanc. Enjoy!